Buying air time isn’t as simple as you’d think. Mike Paterson, of Mid-West Family Media, offers a few suggestions for making the most of your advertising dollar. 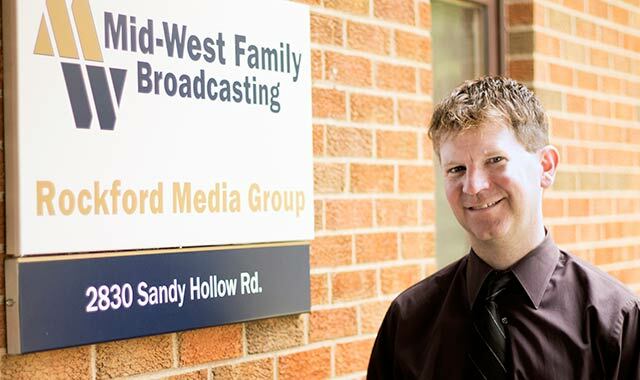 Mike Paterson is the General Manager of Mid-West Family Broadcasting in Rockford, where the company owns and operates five radio stations including 95-3 The BULL, The Variety Station B103, 104-9 The X, La Movida 1330, and The Mighty 100.5 – Rockford’s Greatest Hits. A native of Freeport, he has managed at various levels in many major cities. He is on a mission to rid the Stateline area (and the world) of bad marketing, lazy advertising, and sales people with commission breath. If I had a nickel for every time I’ve heard an advertiser say, “I’ve tried radio before and it doesn’t work,” during my 20-year-plus media career, I’d be serving cold beers from my early retirement job as a bartender on a beach. Yet, on a cloudy fall day in Rockford, I’m penning this piece to help advertisers understand how to use our wonderful medium to communicate to potential customers, instead of simply buying radio. Here are eight “don’ts” that will help you to use the radio medium in a way that drives profits for your business. 1. Don’t buy a radio schedule. Instead, craft a compelling message that catches the attention of your target customers. Then, once the message is complete, figure out which radio station reaches those target customers. Too many times, I’ve seen business owners “work the deal” and then decide on a message. This is a mistake. It’s like buying gas in a 5- or 10-gallon container and then going to pick out a car. 2. Don’t be humble, though a humble swagger is appreciated. Make sure your message makes you famous for something. It’s OK to stand out. It’s OK to bring attention to yourself. Use clear, concise and consistent communication to create wealth. The Shane Company is one example of a multi-million-dollar-firm that uses radio as its primary medium in the 10 cities where it operates jewelry stores. Generally, those stores have the largest share of business in their markets. Tom Shane is the consistent voice on the commercials and the message “your friend in the jewelry business” is always included. That’s what makes the business famous. Having worked with The Shane Company in three cities, I know that many people have tried to talk Mr. Shane out of radio, yet he’s stuck to his plan and grown his business. 3. Don’t worry about ratings or too many other metrics that don’t help you to sell your product or service. If your message is right, your business will attract customers no matter what a metric says about the station’s performance. I’ve worked at the No. 1 station in Atlanta and had ad campaigns fail miserably. I’ve worked at the No. 8 station in a market with eight stations and made an advertiser a millionaire. The use of metrics makes us feel good about our decisions. It doesn’t help us to make the right decisions. 4. Don’t simply “test” radio (or any medium). Commit to a campaign and let it work. I once worked with an owner of a mortgage company who started a radio campaign on a Monday. On Tuesday, he called and said, “I haven’t gotten any calls yet!” I could feel the anger in his voice. My response was simple: “Bro, nobody is waiting by the radio to hear an ad and decide they need to refinance their mortgage.” We had a relationship where I could be sarcastic with him. After six months, he’d closed more than 25 loans and generated almost a four-figure return on investment. Now, he’s a consistent user of the medium. 5. Don’t fall victim to the “I’m a visual product” trap. The most powerful sense we have is our imagination. One time, I was working with a furniture client, and he got busy telling me he was a visual product. I started playing an “imagination association game” with him. I dropped words like “couch, table, easy chair, end table, lamp, and bean bag.” He immediately understood why I did it and said, “Everyone knows what a couch looks like!” He’s been using radio since that conversation. Use words to paint a picture and it’ll carve out space in the consumer’s mind. 6. Don’t buy radio from someone who’s got “Commission Breath.” Too often, in this business, there are sales reps who need to make sales to keep their managers happy. That’s not customer-focused. Our job is to create a long-term customer of the medium, not to use up your marketing budget to hit our monthly quota. If a sales rep from any medium approaches you with a package to buy something, without an understanding of your customers, your unique selling position, or your immediate and long-term needs, simply thank them for visiting and send them back to their office. 8. Don’t be afraid to ask for help. There are many wonderful people in the world that can help with an advertising and marketing decision. If you need direction, don’t be afraid to call me. While you may think I have a bias toward radio, I want to see local business people be successful. I approach every situation from a marketing perspective and what’s right for a certain business situation. Sometimes, radio isn’t right and we make a different recommendation. While I may not have made a sale for our company, I can sleep at night. This entry was posted on Thursday, October 30th, 2014 at 11:56 am	and is filed under Northwest Business Magazine. You can follow any responses to this entry through the RSS 2.0 feed. Both comments and pings are currently closed.